Publisher: Henry and Holt Co.
Diane Guerrero grew up in America with her family undocumented. She delves into the early days of her childhood, birth, and her family’s life in Columbia before they immigrated to the United States. She details her life growing up, her friends, her family, and her struggles in school. It is when she is accepted to the prestigious Boston Arts Academy that Guerrero finds a place where she feels like she belongs. Then both her parents are deported back to Columbia, and she must learn to live in a world without her parents. Her love of performance is what keeps her strong, but in college, depression takes its toll on her life. She details her struggles and how she comes to the realization that she must get help and live life the best she can. A helpful therapist and passion for acting gets her back on the right track, leading her to become a famous actress, as well as an activist for change. 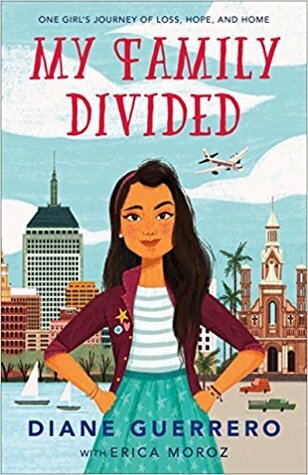 My Family Divided is an honest and heartwarming story about one girl’s struggle with citizenship and family. This is an authentic, tragic tale, but is interspersed with touches of Diane’s humor and humility. Guerrero discusses the nature of representation in the media and how she wanted to be a role model for young Latina girls. Her writing demonstrates the fear and anxiety that undocumented immigrants live through everyday of their lives, as well as the lives of their children. She discusses and shows how the unfair treatment and oppression of undocumented workers personally affected her family. Guerrero reflects on her childhood in a truly genuine way in which her voice and personality truly shine. Her struggles are real and her memories are at times painful. But they are also combined with joy and wonderful moments of self-realization. This is a wonderful, touching, and inspiring memoir.